WOTOFO Vaporous RDA is a rebuildable dripper atomizer with 24mm diameter. 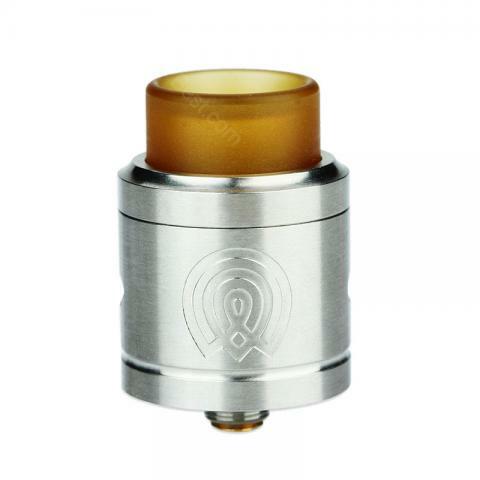 The Vaporous RDA has a unique dual post hybrid clamp and staggered terminal style build deck with four wire holes, which is suitable for a wide variety of coil builds. It’s suitable for both single and dual coil configurations. WOTOFO Vaporous RDA is a 24mm rebuildable dripper atomizer that features a unique dual post clamp deck with four diagonal wire holes. The Vaporous RDA offers multiple coil installation options, both from single coil to dual coil and from simple coil to complex coil. The embedded deck design, wide bore ULTEM drip tip and adjustable airflow contribute to a better vaping experience. With included bottom feed pin, the Vaporous RDA is suitable for most squonk/bottom feeding mods on the market. Love this rda, no leaks. I must say Wotofo has those good rdas. Arrived a little bit late, but it's a rda tank indeed. Highly recommend wotofo vaporous! Massive clouds out of the vaporous rda! Can do both single coil and dual coil. Very dense cloud. And it's cheap now.